bestowed upon us, that we should be called sons of God! And that’s what we are, sons and daughters; children of God! from his dirt, his dust, his murky sod. to the dictate of his iron yet merciful rod. for it shalt not come near thee. Tempest, terror, just what is that? you, when you hear the news. anything that makes you feel life’s blues. in that soothing and eternal-like snooze. and take a never ending cruise. conquerors through him that loved us. To prevail when everything seems against you. To put under subjection the evil one and his motley seed. instead of letting the blues master us. Instead of crying or giving up, give Jesus praise! Open the book, read it! You will be surprised at what you find in there. Open it, read it, eat it, if you dare. There is real peace – in the mighty name of Jesus! and what you need to do to be his. to preach good tidings unto the meek. the beginning, the middle or the end. We gotta read all the word that God did send. that accepts the things we have been told. just because you stand in the Lord bold. It may occasionally feel as though Jesus has forgotten us, hang in there, He has not. Just don’t neglect to keep our actions and prays in the pot. He will answer those who diligently seek him. In the meantime, thank him, raise your hands and your voice and give him praise! through him that gave his life for us. We are more than conquerors with little fuss. 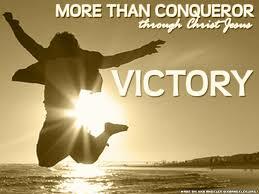 we are more than conquerors y’all!